Black Hawk supply and fit upvc guttering, deep flow upvc guttering, aluminium guttering, upvc down-pipes, aluminium down-pipes, in South London and Surrey. Black Hawk are experts at fitting maintenance-free upvc fascia, upvc soffits, upvc cladding. Traditional wooden fascia, wooden soffit, wooden cladding. We offer a specialist roofing service covering flat roofs, tile roofing, slate roofing, roof repairs, lead work, chimney repairs and chimney pointing. 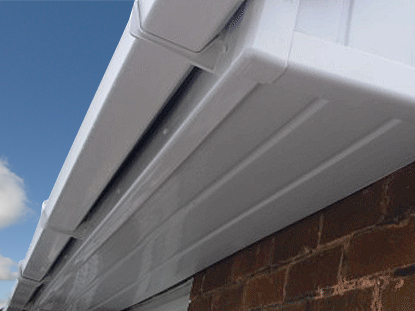 We offer a number of fascia and soffit options. The most common option is a full replacement of the old wooden fascias and soffits with UPVC this means no more painting. This was the result, looking brand new for years to come and no more worries for our customer.